Radiologists at King’s College Hospital in London have been able to substantially reduce the number of follow-up CT scans ordered for children who sustained blunt abdominal trauma when they started to use contrast enhanced ultrasound (CEUS). With the adoption of CEUS, radiologists have been able to reduce the cumulative radiation dose exposure to a particularly susceptible population, consultant pediatric radiologist Annamaria Deganello, M.D., told attendees at the AIUM/WFUMB convention held March 21-25 in Lake Buena Vista, FL. Numerous prior studies have shown that ultrasonography is an immediately available, cost-effective and useful imaging tool to evaluate blunt abdominal trauma in children. CEUS enables better identification of traumatic organ injuries, especially in its ability to improve the sensitivity of ultrasound in the detection and assessment of traumatic parenchymal lesions. Computed tomography, however, remains the diagnostic gold standard. Dr. Deganello and colleagues conducted a retrospective study to determine the value of CEUS as a follow-up exam for children and young adults who received treatment for blunt or penetrating injuries to solid abdominal viscera at King’s College Hospital between 1998 and 2013. They documented the number of CT and CEUS scans performed as follow-up exams and compared results. The researchers also recorded the number of patients who had CEUS alone as a follow up exam. Over the 16 year time period, a total of 161 girls and 605 boys, ranging in age from nine months to 20 years, had CT exams performed to diagnose suspected abdominal trauma. Almost 15% of these patients had at least one follow-up CT scan, and of these 112 patients, one third also had CEUS. In all of these cases, CEUS enabled accurate diagnoses of complications to be made, and in three cases, lesions could be identified that were not visible on CT images. Dr. Deganello reported that after CEUS became available at the hospital in 2011, 40% of all pediatric patients being followed for solid organ injury were able to have a CEUS exam only. No follow-up CT exams were needed. The findings of this study supports findings of a study published online March 31, 2015 in La Radiologia Medica of 73 pediatric patients who presented with minor blunt abdominal trauma at the emergency department of S. Camillo Hospital in Rome between October 2012 and October 2013. The patients underwent both CEUS and CT exams as emergency patients. Results of follow-up studies were outside the scope of the retrospective study. Sixty-seven of the patients were confirmed to have abdominal trauma after CT scans were performed. 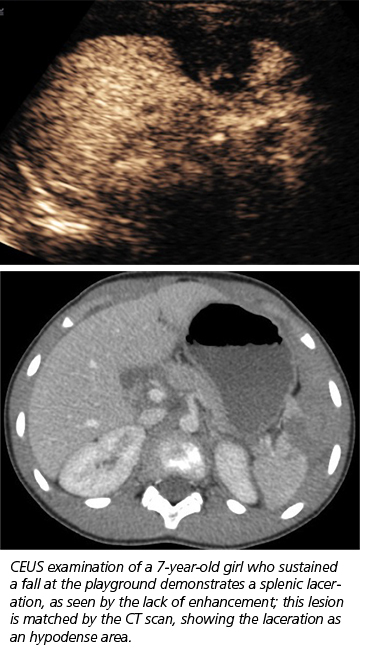 CEUS examination identified 100% of the patients with parenchymal lesions, 35.6% of whom had lesions of the spleen and 28.8% of whom had lesions of the liver. Lead author Guendalina Menichini, M.D., and colleagues wrote that CEUS is more sensitive as CT in the identification and characterization of solid organs lesions in pediatric blunt abdominal trauma. They stated, however, that CT remains the gold standard for identifying prognostic indicators, such as active bleeding and urinoma. Both studies concur that CEUS is an accurate and useful modality to assess and monitor blunt abdominal trauma in children. Menichini G, Sessa B, Trinci M et al. Accuracy of contrast-enhanced ultrasound (CEUS) in the identification and characterization of traumatic solid organ lesions in children: a restrospective comparison with baseline US and CE-MDCT. Radiol Med – Published online March 31, 2015. CEUS can reduce need for CT exams for children with abdominal trauma . Appl Radiol.